As the ICC moves towards a test championship it is worth reflecting on the most significant barrier to potential reform: the financial impact of scheduling changes on the members involved. At present, excepting some tour payments that cover costs, full members sell their tv rights, and take the full amount of local revenues whenever a team tours. They sell those rights globally, meaning that for many members in small markets, the bulk of their income from test cricket comes not from their local market, but by selling their local content to overseas television. Moreover, because those stations are primarily interested in their own local team, only three tours are worth significant amounts of money (if not profit): India (by some margin), England and Australia. A fuller explanation of these values is outlined in this post. The disparity between the value of these popular tours and everything else is so great that my estimate puts the value of marquee tours at something like half of all test revenue. And the value of a big-3 tour to anywhere at 65% of all test revenue. The significance on this on governance can also not be over-stated. As the vast majority of touring revenue comes from hosting the Indian test team, this dynamic allowed the BCCI to rake in power to itself by trading tours for votes, and the threat of no tour for compliance, prior to the reforms (after which they no longer needed to manhandle the other board members). As we shift towards a test championship and more sensible structure, the existing revenue distribution suggests several barriers to any proposal being approved. As the big-3 make a significant proportion of revenue from their incestuous touring schedule. The more evenly the schedules are created, the more money floats out of that bubble and into the general pool. Under reasonable assumptions, a seven team division with an even number of matches would shift around $10m in revenue per year from the Big-3 (mostly Australia and England) to some of the other full members. In the context of their billion dollar incomes over each cycle, that isn't a huge amount. But that figure hides a more serious problem at the other end of the table. Every one of the other full member nations depends on those periodic tours from the big-3 to top up their revenue. By creating an exclusive top division, and removing them from that revenue source the West Indies and those below them will find their own $40m hole in already teetering budgets. The broader the base of nations that need to be sustained, the larger the revenue drop for the big-3 will be. As marquee series are also more popular amongst local fans, there is no guarantee the drop off in overall revenue from reducing them will be regained from the context of a test championship, nor where that money will end up. Uncertainty will push administrators away from any proposals. With one or two exceptions, they are inherently risk-averse, and focused primarily on what their board will receive, rather than the potential growth of overall revenues. If fear of uncertainty - and potential losses - will kill any proposals, then that suggests two measures by which a future test championship could incorporate features of the existing distribution into future programs. Firstly, as noted above, the touring calendar of the Big-3 is roughly evenly split between their marquee series and everyone else. Although survey responses to date indicate a strong preference for a championship to be an all-inclusive part of the FTP over a short tournament, there was a split response over whether series should be of even length, and the maintenance of marquee series ranked highly among the presented aims and concerns. At least amongst the fans I have had respond, the maintenance of series like the Ashes ranks as important as creating a working championship format. One possibility is to split the four year cycle, between bilateral fixtures in two years, and a test championship in the others. The existing marquee structure would remain in place, and the big-3 would suffer no potential revenue or fixture losses, as those tours would continue as they do now. However, the institutionalisation of marquee fixtures would fill the calendar in the space reserved for bilateral tours; removing the ability of the other full members to attract the big-3 for tours of their own. To circumvent that, they need a source of revenue from the test championship. The second reform to achieve financial stability is for the other members to collectively bargain their home touring rights. At present, there is a zero-sum game in attracting tours from the big-3. Relegation presents itself as a removal of lucrative tours and financial armaggedon for members who drop out of the top tier. By pooling their individual home rights in test championship years, and selling them via the ICC as a packaged tournament, it would no longer matter who the big-3 tour in that part of the cycle. All money would be collected and distributed amongst the members involved: partly by need, partly by performance, partly by value foregone from signing away their collective rights. (The big-3 signing on is optional, but preferable from a commercial perspective.) As each member is also now invested in a test championship, it is in their interest to create a format that maximises revenue: by competitiveness and meaningful matches. The exact nature of that format is outside the scope of this article. It is possible to have strict tiers over a cycle, and fluid ones, that move from qualification stage to qualification stage. Each has their merits and followers. Without financial reform though, in which the ICC must take a central role, there are too many reasons for members to opt out of a system that, broken as it is, provides low risk grease for the financial wheels of smaller members. A more robust system, via collective agreement is possible, and even necessary if scheduling reforms are to be achieved. The first test between Australia and New Zealand may not have hung on the non-dismissal of Voges at the end of the first day, but the 232 runs it cost New Zealand certainly made it a lot harder. Predictably, a noticeably wrong umpiring decision led to a renewed call for third umpire reviews on every delivery, the return of the back-foot no-ball rule, and some less predictable, non-sequiturs about punishment. Tennis has, for over 30 years used electronic means to judge service calls, and more recently, detected let calls with motion sensors. These are relayed to the central umpire, and they use that in calling the point. No-balls in cricket are slightly more complex, as they depend on the position of the foot over (not necessarily on) a line, with confounding shadows and the curved surface of the ground preventing the use of light beams that worked (mostly) for tennis. With a fixed side-on camera with a clear view of the line (two is preferable), it is incredibly easy to build a system that will detect a landing foot within an area, and decide if it fell in front of, or before the line. Computer vision techniques, the sort used by path finding robots, have been around for several decades. I learned the basics (in 1998) and those and more advanced techniques have been developed into the free OpenCV library I used for the code outlined below. 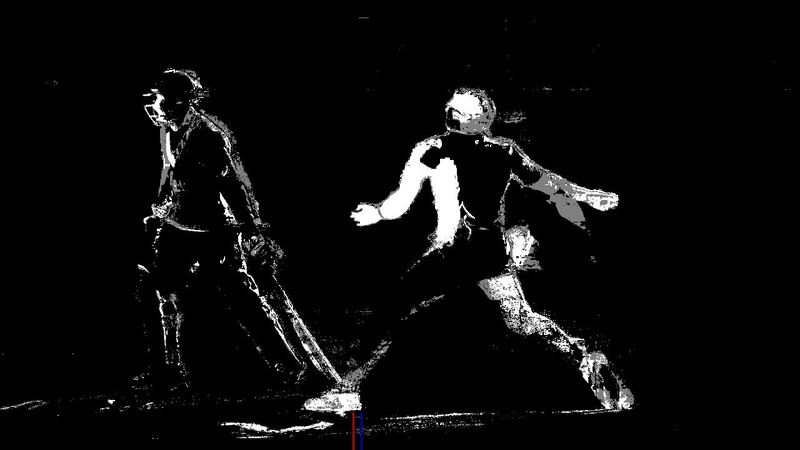 To give a sense of how ways it would be to implement automated no-ball checking: my code, using not-particularly high-res footage, sans any setup programs, a live stream, or communication device to the umpire (a phone will suffice for that though) took me around 14 hours. But that involved me learning, from scratch, the OpenCV library, installing Java and SBT, and relearning some coding techniques. There is no excuse for no-balls not to be automated. It is a trivially easy application of computer technology to a glaring issue. Step 1. The code [downloadable here] uses the VideoCapture to load the video, and the BackgroundSubtractorMOG to detect edges from the non-filled part of the crease. This image shows white areas where there is movement from the previous sequence of frames; grey areas show where there is a change, but the same colour as before (indicating shadow). You can see the outline of the bowler as he moves through the crease, and the non-striker backing up. In a real-world application it needs to specify the side of the pitch to view, and be turned on and off for each ball (as hawkeye also would, so the same operator could be used). There must be at least ten rows of pixels (out of 20) with a continuous line longer than 60 pixels (about 8 inches), and less than 120 pixels. That line is compared to the crease line, that is configured before hand (the red line in the first image). 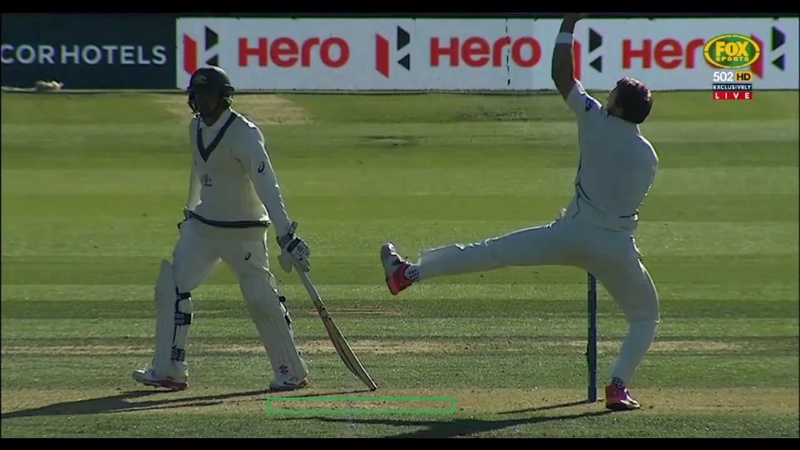 Needless to say, on the ball in question, the bowler was unquestionably behind the line (by 9-12 pixels, or 3-4cm). Assuming a stream from the fixed cameras could be obtained at the ground, a working and fully tested system could be in place in less than a month. Sometimes, there really is an easy solution. The sudden surge of interest in a test championship, led by the ICC who have commissioned a study into possible formats, has renewed the periodic influx of ideas for how it can be implemented. These range from short tournaments of a few weeks, through Davis Cup style home-away knockouts all the way to leagues with relegation and promotion. Deciding what is "best" depends completely on what criteria is being used to judge. In this respect, the absence of a discussion on what a test championship should aim to achieve, is notable for its absence. This survey attempts to bridge that void. In short, it is impossible to sustain more than 12 tests per year for top class players. This equates to around six tests during a home summer (over 9 weeks), and another six played away. Beyond that, burnout, injuries and retirements (or abandonment to T20 contracts) are nearly certain. Perhaps obvious, but important to remember that a team needs to be playing at home during their season, and away at other times. Schedules that bounce them into unfavourable climes risk washouts, financial losses, and lack of interest. The big question. As structured the FTP guarantee of home fixtures is what lubricates the professional structure. Changed, and the money needs to still flow, either via ICC television rights and distribution, or some other mechanism. The second set of aims are more complex. By themselves, each is (probably) desirable, but many are in conflict with each other. The purpose of the survey below is to assess which are most important, when administrators have to choose. A system that promotes and relegates sides must react neither too fast, nor too slow to the vagaries of form and ability, maintaining traditions and competitiveness, lending itself to expansion, but creating a (sellable) spectacle. It is possible, but not simple. Eleven have been identified, and a brief description is attached to each. The bugbear of the current FTP, that it is too full. A better structure must allow new nations to emerge, and find their place. For test cricket to thrive, it must be the goal of players. If T20 is to be the high point of cricketing glory, then players will naturally aim for that instead. Or competitiveness. Which will help ensure that games are exciting to watch, immaterial of the context in which they are being played. Traditional, in this sense, referring to nations with shared sporting history, but often sporadic cricket fixtures (such as Australia vs New Zealand, or England vs Ireland). A subtle difference to the marquee fixtures above. Opportunity for players in developing nations rests on their ability to compete with the best, if they deserve to do so. But teams are often only good for a few years, and a structure that took a decade to promote a side will miss that chance. Test cricket, more than any other sporting contest, is difficult to win by luck alone, but a knockout match in one specific set of conditions, could still produce any result. A tournament promoting itself as finding the champion ought to neutralise those advantages. Knockouts are easier to schedule, but cricket has traditionally used series and tours. A championship can be constructed both ways, but other aims are easier in a short tournament. As seen in football, a team can win trophies in two distinct styles: via a league trophy (effectively best ranked) or via a cup with a final between the best two sides. Here again, the timing of a tournament matters. Cricket, like football, or the Olympics, usually runs along four year cycles, but shorter, or longer tournaments are possible. That is a diverse set of aims. It is not possible to have them all. Competitive balance contradicts with an expansion program; knockouts will lend themselves to an exciting tournament but not necessarily the best team; making all cricket meaningful makes scheduling hard, and could cut into marquee and traditional series; and longer series of equal length make it hard to give opportunities to other nations. To assess them I have constructed a survey that looks at both these aims, and some major issues around the construction of a new FTP and bilateral structure that would implement a Test championship. It does not look at any specific Test championship structure, but rather what matters to the various stakeholders. Feel free to include any proposals in the comments, along with your reasoning. A somewhat (very) delayed summary on account of a house move over Christmas. Something that also rather prevented me from watching much of the cricket played. The headline after the Boxing Day test, about the resurgence of fight in the West Indies, underlines how vast the talent gap remains between their test squad - shorn of several players being feted for their BBL performances across town - and an emerging Australian side. The fight waned quickly too, with barely a whimper on day two, as they awaited an inevitable declaration on the back of four top-order tons, and collapsed to 6/91 by stumps. Some generous declarations meant that the margin of 177 runs with a day to spare seem closer than it was. The chance to perform a heist and win despite taking only 6 wickets in the match was there, but they never got close, and even then, only because Holder won the toss and bowled. Australia`s rating took another hit in the third test when three days worth of rain left them no chance of pressing for victory. The West Indies batting had, by series end, put up some middling totals (here, 330) but few big innings, and for all the (very) occasional bursts from Roach and Taylor, and the steadiness of Holder, they`ll win very little conceding such hefty totals so easily. A series talked down before-hand, that met expectations. A resounding victory for England, on the back of some exciting cricket, that came in surges, but from multiple directions. Interestingly, although South Africa entered the series with a long tail, and England played throughout with Moeen Ali at 8 and Broad, whose batting seems to be returning at 10, it was the home side who scored more from the bottom of the order. England, as they did in the Ashes, won less being consistently better than their opposition, than from winning at specific times: Ali and Finn twice knocking out the middle order in the first test and Broad`s 6/17 in the second test were sufficient to win, once the contributions of the batsmen were added up. Only in the final, dead test, when South Africa managed to build a platform for Rabada to showcase his talent, did England look like they lacked answers. South Africa, by contrast, have finally entered a full rebuild. They weren`t in many ways, as bad as the result over the first three tests suggest, but far too few batsmen made starts, and without Steyn they were depending on Rabada to run through the English order. Now fourth, and possibly dropping as low as sixth, in the rankings, makes it seem a propitious drop, the top six are closely matched, and almost any of them could find themselves top of the pile in the next couple of years. There is, pleasingly, no better time to institute a test championship. South Africa`s sudden ranking demise has raised the issue of their legacy. Jarrod Kimber wrote a fine article on their almost greatness, the quality of their away record, and its limitations at home. The ratings put them in a similarly uncertain position in the pantheon. In the post-war period, only five sides have maintained a rating above 1280 for more than two years: Australia from 1945-53, the deeply under-rated West Indies of 1965-68, the somewhat less under-rated side of 1984-90 (barring a blip in 1987-88), Australia from 2001-09, and South Africa from the beginning of the NZ series of 2012/13 to the (unfortunately) drawn match against Bangladesh of 2015. They sustained a long period of being very good, but until 2013, they never ended a season (northern or southern) as the number one side; didn`t have the highest peak rating of the period (their 1324 is slightly below England`s 2011 India bump of 1333); and didn`t maul sides in a way that would have marked their dominance. But they got mostly results, more-so than England of the 1950s, which struggled on numerous tours either side of their Ashes victories, and sustained it longer than the bursts of England of 2011, or Australia of 1958-60 and the unknown of South Africa of 69-70. Jarrod has, I suspect nailed it: they were one of the five best sides of all time - though fifth, and ahead of 1950s England, but behind 1960s West Indies - but not great. Just really good. Rabada and an uninjured Steyn and Philander may yet combine to produce a late resurgence that further cements that place, but to sustain greatness, you either need all of your players to be of a similar age, or to maintain a production line of brilliance across a true great`s career. South Africa had some true greats, but the support cast was only briefly good enough to match them. Speaking of test championships, the bilateral system heavily favours Australia not playing New Zealand, despite their close geography and multiple sporting connections. There is not a huge amount of money in it, and with their peak summer at the same, it is better for both to have a touring side from other climes. But this is a pity, because although often mismatched, they provide an interesting match-up, and both sets of fans enjoy the buzz of playing each other. A test championship that worked in this series more regularly would help drive interest in NZ cricket, at the exact time they have a team to capitalise on it. In this series, New Zealand, at home, have an expected margin as close to Australia as they have been since the 1980s when they entered as favourites. This is a harder challenge, and a loss is still the likelier outcome, but a drawn series, as in 1993 would reflect the relative strength of the two sides. The proposals for a rebirth of a test championship raises the interesting question of what to do when a knockout test match is drawn. The broader context allows some default options, such as the higher ranked, or higher placed team progressing, or to calculate an aggregate margin in a drawn series. But depending on the format, there will often be occasions when teams need to be separated within a single match. Six options are discussed below, and their merits. For the purposes of an example, Australia`s most recent draws (against New Zealand and West Indies) will be cited. Assume in both cases that it was a single match series. The traditional option, in many ways, as it was used to decide series in Australia even after the war, when the final test was decisive. Pros: Result is not contrived, but within the match. Cons: Discourages assertive batting; can cause significant scheduling problems if a test is drawn out, particularly in a tight tournament. v NZ: Australia would have batted on in both innings, without the loss of wickets that proceeded the declaration. New Zealand would need at least 217 runs with 8 wickets in hand. v WI: Another 28 wickets needed to be taken. Practically another test match. If a competition has a group stage this would mean by higher points tally, but in a straight knockout would fall back on the ICC rankings (and their foibles). Pros: Is immune to the weather; both sides know what to do. Cons: Isn`t decided on the field; encourages the higher ranked (and stronger) side to play for a draw. Five days of cricket completed in a different format, just to get one. Pros: Is quick, entertaining, and decisive. Cons: Ignores the result of the actual test; is also stymied by rain (particularly on day 5); would encourage teams that were beind (or strong at T20) to play for a draw. In the event of a draw the highest first innings would win. A format commonly used in club cricket, and to get results in first class competitions. Pros: Makes for exciting cricket in the first innings, as a team must stay in front. Cons: Would discourage declarations and attacking cricket; It is possible to rain out a first innings too. AUS require 154 runs. Match result undetermined. In the event that the final match of a series was a decider, the average per wicket for the whole series could be used in the event of a draw. Otherwise this is equivalent to the count back method, below. Pros: Gives teams a clear idea of what they need to do. Cons: Favours the side batting last as they`ll only use their best batsmen; in a series works against the team that won the decisive moments (ala England in `09 and `15); discourages going for a result over building a big total; encourages declaring on tail-enders. In this format a team must declare their second innings (the third innings) when they have used half the match overs (usually 225). The team with the highest total would win, regardless of wickets. In the event of rain or slow over rates the allotted overs would need to be adjusted - in the event of late rain this would require a D/L style decision (or count back, as below). A single reserve day would significantly reduce the threat of confusing results. Pros: Provides a finishing chase on the final day; ensures both teams to know what they need to do. Cons: Could become messy with lost overs; a lot of rain would end up like an ODI. In this format, the team that was ahead at the loss of that particular wicket in their own innings would be declared the winner when time ran out. This would mean at any time in the match (after the first innings) a team could tell if they were in front. Pros: Doesn`t unduly favour either side, and allows a match to fluctuate particularly as a draw approaches; discourages bowling for a declaration. Australia`s next wicket was at 829, meaning Australia would win if they`d taken a wicket in the last hour. West Indies 7th wicket was at 246 meaning West Indies would need to take 5 wickets for less than 73 runs in the last hour. The Intercontinental Cup and World Cricket League championship returned albeit without much play in Hong Kong, and in a series of one-sided encounters between the Netherlands and UAE. Andrew Nixon (@andrewnixon79) joins Russell Degnan (@idlesummers) to discuss the recent round of matches, and the ongoing Ireland-PNG series (0:20). The U-19 world cup is half run and Nepal and Namibia produced some significant upsets (9:00). And Afghanistan is playing Zimbabwe again (18:00). There were aso matches by the ICC Americas side in the West Indies (19:50) and mens and womens East-Asia-Pacific squads in country Australia (21:40). The ICC conference was ongoing when we record, but we set the scene for the numerous discussions being held (24:00). There is news from Hong Kong with the suspension of Irfan Ahmed and ascension of Ryan Campbell (29:30), Ireland women (38:30) and not enough regarding Suriname as WCL5 draws closer (42:00). Finally, we preview the Asia Cup (35:00). Direct Download Running Time 46min. Music from Martin Solveig, "Big in Japan"